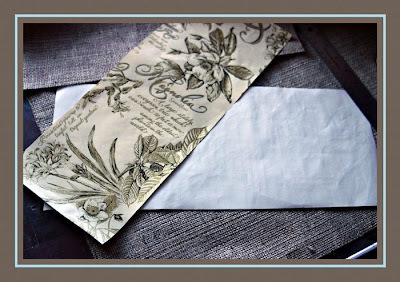 Christine over at Chocolate and Steel has this really great feature, where she highlights some of the great undiscovered talent on etsy. 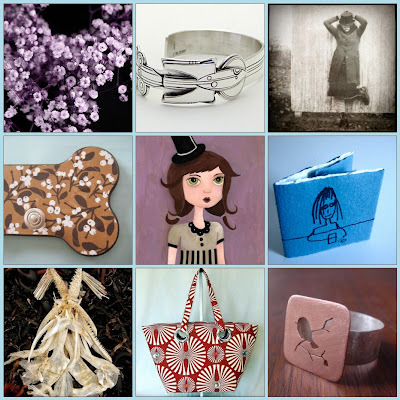 I really love this idea, so my Weekend Eye Candy this week features all undiscovered talent over at esty. 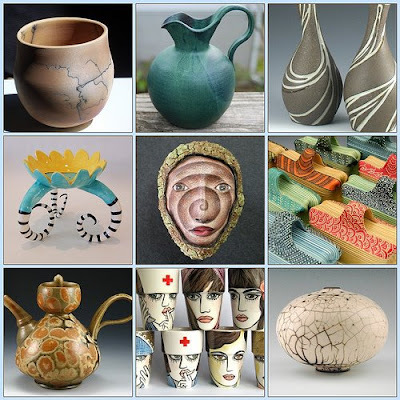 These folks have created some really great work and are yet to have the sales they deserve. Now I'm off to Such and Such and Chocolate and Steel for their weekend inspirations. One of the known side effects of crafting is accumulation. But this happens slowly over time, so rarely do we see the evidence staring us in the face. 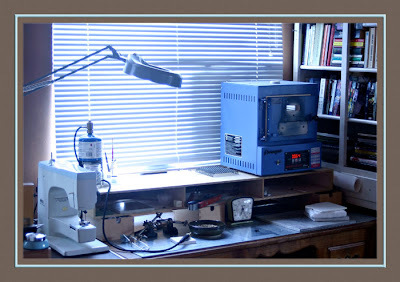 But, this weekend, I had to open my old photobucket account and I found a picture of my original PMC workspace. This is from 2006 when I got my first packages of PMC. That's how innocently it all began. 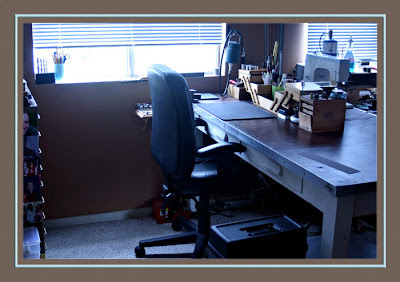 And now...I have two worktables..
And several storage units for...well...stuff. This is my favorite cabinet, and the only piece of furniture in my workshop that I actually paid money for, everything else is street finds or hand me downs. Thanks Boy's and Girl's Club of Venice. 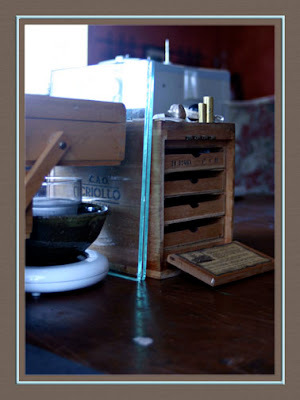 And this one is my favorite table top storage piece, an old cigar box with drawers. Isn't it the sweetest thing you've ever seen? 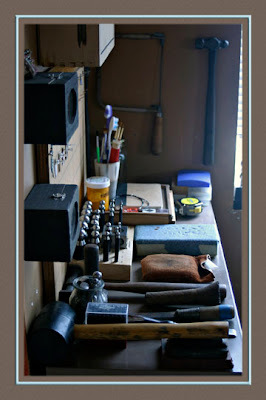 And that doesn't even begin to address the tools, tools and more tools I have accumulated during this short 3 going on 4 year period. 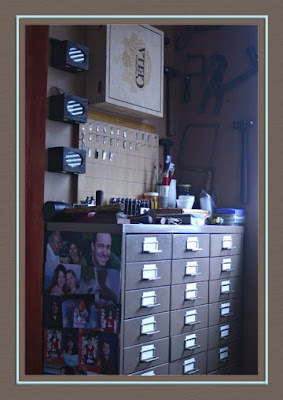 Aaaaand I have the closet you saw in my "Order Restored" blog from a monthish ago. Wow, where did it all come from? Don't get me wrong, I love my stuff and wouldn't change a thing. But seeing the humble beginnings this weekend, then looking at all that I have now, and thinking of all the stuff on my wish list...I was a little amazed. Sewing is not my first language. I like to create my own patterns but I don’t think in fluent “sewing”. This means I have to construct things to realize that they totally don’t work. But I have a really hard time reading other peoples patterns: because I don’t think fluent sewing. It’s a vicious circle. 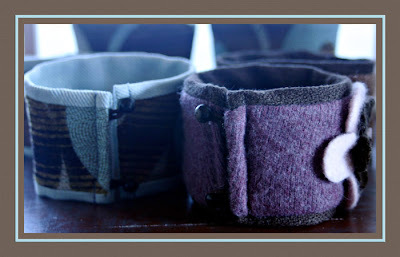 But for this project all I wanted to do was rework the pattern I created for a felted bag. I just wanted to simplify the bottom construction. That should be super simple, right? Well not if you don’t think “sewing”. So I got this little mess at first. It turned out about 4 inches to short. Oops! 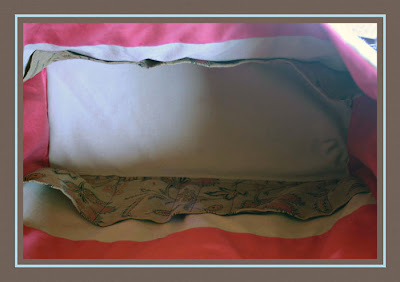 The seams were crazy bulky and my elna didn’t want to sew through them. And my elna will sew through almost anything. I love that machine. Once I got that mistake out of my system, the new pattern came together great. And I want to share a fun pattern trick I use. I love good quality wrapping paper, but it’s expensive and I’m cheap. So to justify buying good wrapping papers I use the left over wrapping paper to make my patterns with. Win, win. So here’s the new bag in all her glory. I’m really happy with how it turned out. And the construction is easier than the original pattern. 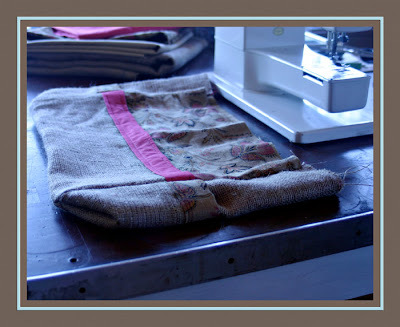 The burlap is all lined with the pink so you can see pink through out the bag. I like to have pockets on my bags; I’m a function first kind of girl. So each end has an outer pocket, for my keys and cell phone. 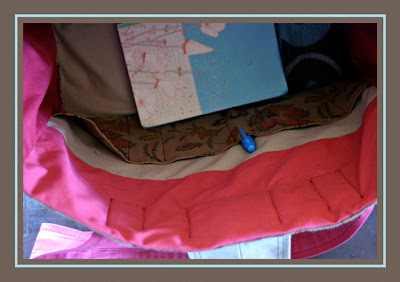 And the inside liner has many little pockets for pens, ipod, notebooks, and much more. 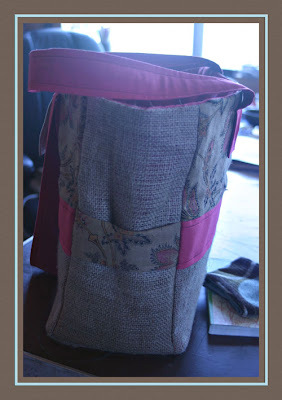 I want to thank Maya over at Maya Made; her burlap buckets were a big influence on this fabric combination. 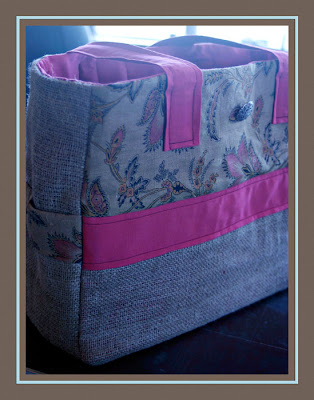 I loved the look of her burlap and knew I wanted to add some to my summer bag. Thank you Maya. Thank you to everyone for your comments and proof reading. It was all really appreciated. I only had 7 strangers and one friend enter to win so everyone is a winner! It's my blog I can change the rules, can't I? Soooo...Karen Gill, Auntrene, Sarah - thrifty minnesota mama, Sarah Crawford, Christin Banda, And Julie - jnkurrie You are all winners and I will email you so you can give me an address. And Pat Evans, I know you didn't feel lucky but, you are a winner also. Pat you didn't give me an email address, so please email me at hsb(at)paigelitfin(dot)com with your address. 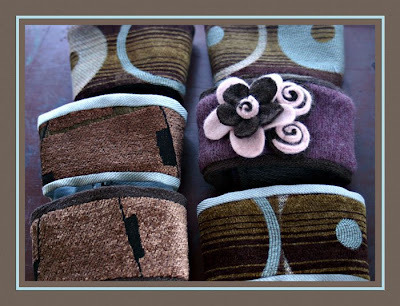 I will get the cozies in the mail as soon as possible. I hope you have a creative weekend. I'm off to check out what Lora and Christine have for Weekend Eye Candy. I'm having my first giveaway to celebrate two very cool things. One, I have successfully blogged for one month, ya!! Two, I put my first 5 items in my etsy shop today. 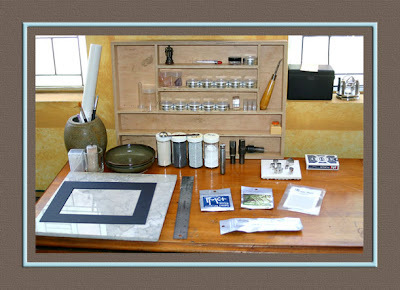 One of the things that really drew me to the craft blog community was the generosity. 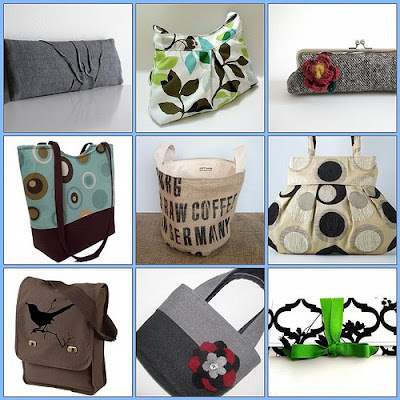 Ideas, inspiration, tutorials and, can you image, giveaways of beautiful items. Just given freely and with love. Who are these amazing people? So I'm super excited to have my first giveaway. To give a little something back to the community that has given me so much. Here is what you can win. 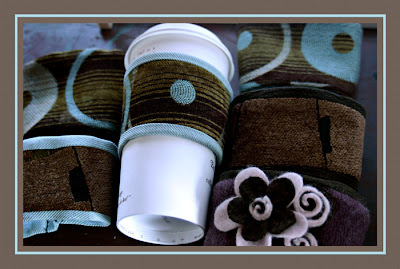 I make these fun to-go coffee cup sleeves, a pretty and green alternative to the cardboard sleeves. 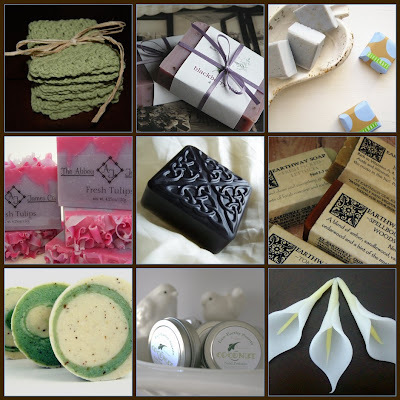 I whip them up as gifts for friends and family. They seem to like them, I hope you do too. I have 6 to give away. So 6 lucky winners. And yes I know one is totally different from the rest. I had some left over felt and felted flowers from a bag I made a friend, and I thought, why not? The rules of the road for this giveaway are simple, but you can really rack up points here. You get one point if you just check out my etsy shop and leave a comment. Good, bad, or ugly, I welcome all input. 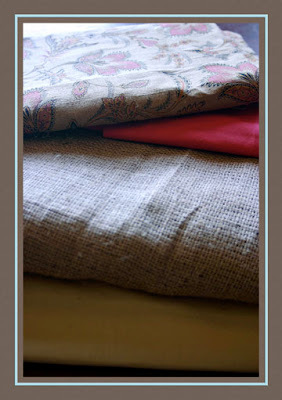 You can get another point if you blog about my giveaway, but make sure and comment to let me know you blogged. And last you can get a point by helping this Dyslexic out with her proof reading. (Dyslexics of the world "untie"). 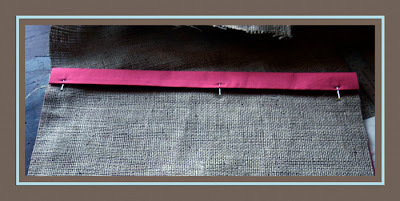 If you are the first to spot a spelling error on my etsy site, comment about it, and I will give you another point. One spelling error per person. That way my mistakes can really spread the love. 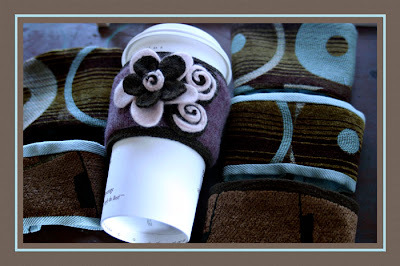 The sleeves have buttons and elastic in the back, so they adjust to fit all cup sizes. The giveaway is over next Tuesday the 12th. I will announce the winners on Wednesday the 13th. I really need to make myself a summer bag. I love my felted tote bag buuuut I've been carrying it for a year and it's not very summery. To give me a little extra push this weekend's eye candy is all about the fabulous bag. Enjoy. I'm off to see the fantastic Weekend Eye Candy at Such and Such and Chocolate and Steel. Have a great weekend.